Winter in upstate New York State snow country can be difficult for any track and field athlete. But athletes in the Rochester area have found a way to overcome the often-brutal conditions. The latest is Vanessa Watson, a senior at Spencerport High School, just outside Rochester. 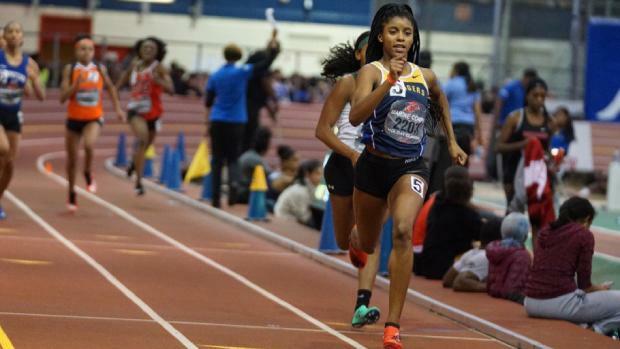 The five-foot seven, 135 lb., Watson, a former soccer player, described as "a gem" by her coach, Michelle Marasco, will be out to defend her 600-meter title at the New York State championship meet on Saturday at the Ocean Breeze complex in Staten Island. 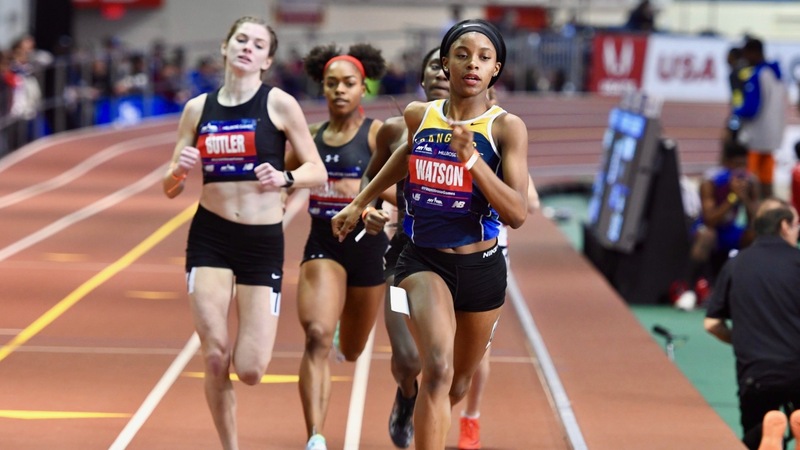 This past Saturday, Watson won her third consecutive Section 5 Qualifier, running 1:33.28, a race in which the runner-up was more than seven seconds behind. Her indoor credentials include a 24.96 in the 200 meters, a fast 1:12.83 in the 500, and a 1:30.09 at 600 meters. But as dominant as she's been indoors, she's probably even better outdoors. With solid marks from the 100 meters through the 800 distance, Watson opened eyes last spring when she clocked 57.77 in the 400-meter hurdles. This winter, she was third at the Millrose 600m, running 1:30.84, with Athing Mu of the Trenton Track Club winning the race in 1:27.36. Mu, only 16, gave everyone a mark to shoot for in the future by setting the American record this past weekend in winning the Toyota USATF Indoor title in 1:23.57. Spencerport fields an indoor team of only a dozen girls. That doesn't seem to bother Watson or her coach. "We have great teammates," she said. "We do what we can." What they can do is running in the hallways of the high school. "We have a school with an indoor courtyard," said Marasco, "so we run the entire square, which comes out to be nearly a quarter-mile." Twice a week, the team heads over to the indoor track at Rochester Institute of Technology, where Watson can stretch out a little more. Marasco, now in her second stint coaching, has also taken Watson to the swimming pool, a must these days for athletes who train hard. "And we've introduced her to ice baths," mimicking the practices of professional track and field athletes. Watson trains hard, with Marasco saying, "She has a tremendous work ethic, and it's great to watch someone like her achieve their goals. She's phenomenal at what she does." Coaching Watson outdoors has been something of a community effort, where she works on the hurdles with her father and club coaches. 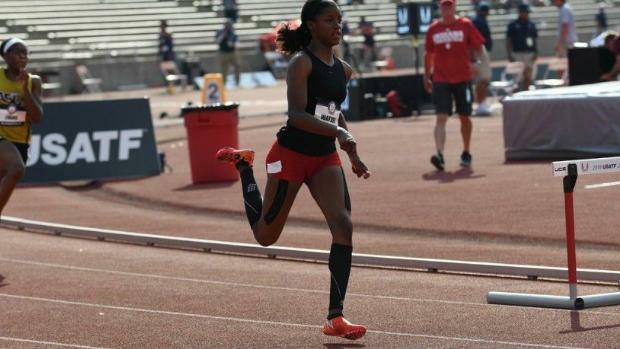 She also had help in the past, training part-time with sprinter-jumper Lanae-Tava Thomas, the former Rush- Henrietta star, who is now a freshman at the University of Southern California. The two remain close, and Watson says, "I'm following her performances, and I'm really happy that she's doing so great out there." Another "hero" is Sammy Watson (no relation), also a former Rush-Henrietta athlete who won the NCAA 800 title at Texas A&M. "Having these people do well at the next level sends a message to the younger athletes," said Watson. "It shows it can be done." 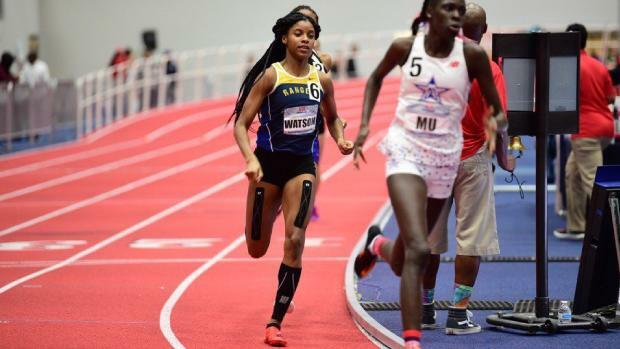 The team-oriented Watson received a double thrill this past Saturday, as her 4x400-relay team, with two freshmen, also qualified for the State meet. "Training with the freshmen has been great- I'm so glad for them," said Watson. "I really wanted them to qualify and experience the competition at States." Marasco said, "Having someone like Vanessa- she's a gem. It's also been a great learning experience for me personally." The coach added, "Vanessa is very coachable, and she has a certain standard. That makes a difference." College coaches came calling, but Watson heads to the University of Tennessee in the fall, choosing the Vols over Baylor, Auburn, and Texas. She said, "It was the last place I visited, and I really liked it there." There's still some unfinished business in high school. After the State meet, she'll rest up for the indoor National championship meet, and then it's on to the outdoor season. "I'd really like to run sub-57 in the 400IH," she says, "but most importantly, I want to continue to learn." And following Sammy Watson and Lanae-Tava Thomas, she says, "I want to leave a legacy."